Australia’s self-inflicted power crisis has reached the point of full-scale disaster, with only one way out: killing subsidies to wind and solar. Australia’s competition watchdog, the Australian Competition & Consumer Commission has finally said what politicians are either too timid or too witless to even think. 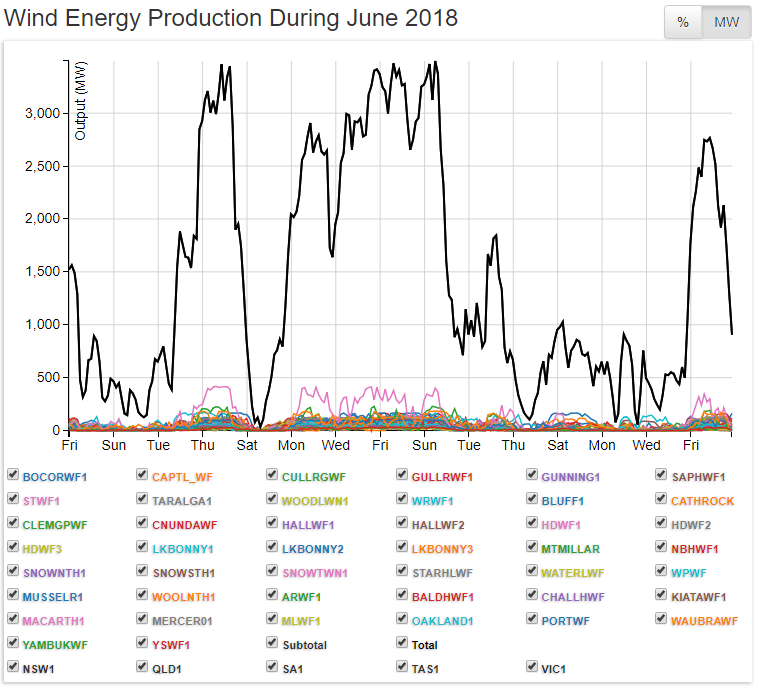 The chaos that’s been caused in the National Energy Market (which covers QLD, NSW, VIC, TAS and SA) by intermittent and heavily subsidised wind and solar caught the attention of the ACCC’s Rod Sims, a character known for his relentless and dogged pursuits of those engaged in uncompetitive commercial dealings. We’ll hand over to The Australian for some more analysis of the most monumental shift in Australia’s energy policy in the last 20 years. Malcolm Turnbull has signalled support for the competition watchdog’s call for government to underwrite the construction of “firm” low-cost power generation, in a move that could end the energy wars within the Coalition. “We’ll look further at this proposal over the coming months … but this recommendation has the distinct advantage of being thoroughly technology agnostic and, well-designed, should serve our goal of cheaper and reliable energy,” the Prime Minister told the Queensland Press Club today. Nationals MPs, who have been critical of the government’s “technology neutral” national energy guarantee, see the recommendation as a way to support new baseload generation, particularly high-efficiency low-emissions coal. Resources Minister Matthew Canavan and Deputy Nationals Leader Bridget McKenzie expressed their strong support for the recommendation today. “The ACCC has recommended the government underwrite baseload power investments. Once again common sense of @The_Nationals is vindicated!” Senator Canavan tweeted. Mr Turnbull said the proposal could be used to promote investment in any baseload technology, including coal-fired power. “It’s technology agnostic. So it certainly wouldn’t exclude any fuel source. We’ve got to stop focusing on one technology or another,” Mr Turnbull said. “It is challenging for people who are not part of the big vertically integrated gentailers, to get finance for new generation assets. The Prime Minister noted the scheme had the same intention as the national energy guarantee: ensuring there is enough baseload power in the system. He said the suggestion to underwrite the construction of low-cost power generation could ensure there is no shortfall in dispatchable power in the medium term before the market responds to the signals in the NEG. “Let’s assume we were going to go down the route that Rod Sims recommends, it may be we don’t have to do a lot of it, or do it for very long,” Mr Turnbull said. “The design of all of this will be very critical, but I think the idea of a put at a low price, and it may be that $45(megawatt hour) is not the right price, maybe it is $40 Mwh or $37.5 Mwh, but you want to hit that mark that would enable more of that dispatchable power to come, more of that investment to come forward. Nationals Leader Michael McCormack welcomed the ACCC report and said the Coalition parties would reach a consensus on energy. “The Liberals and Nationals are working hard to ensure we get cheaper power,” he told The Australian. The recommendation, to improve competition and generation capacity in the wholesale market, would involve government entering into long-term agreements to purchase power at low-cost (about $45-$50/MWh), making the projects more attractive to financiers. The ACCC report said the recommendation, which would apply only to new market entrants and require them to have at least three commercial customers, would involve “little cost”, as energy prices would have to fall significantly for the government to be disadvantaged. Queensland Nationals MP Keith Pitt, who has led a backbench push for the government to support investment in new coal-fired power, also welcomed the call for the government to get involved in the energy market. “Clearly, the ACCC report is absolutely scathing. It says the current situation is unacceptable and unsustainable and I agree,” Mr Pitt said. “As has been reported in the media the Nats have been working internally with our Coalition partners towards practical solution for quite some time. Labor energy spokesman Mark Butler said the Nationals were seeking to use the ACCC report to support their plan “to throw $5 billion of taxpayer funds at building new coal-fired power stations”. “For too long, recommendations for sensible change have been lost in the fog of the civil war being waged in the Coalition Party Room over energy policy,” Mr Butler said. Amid calls from National Party MPs and conservative Liberals for a Royal Commission into the energy market and calls from the Greens for a commission of inquiry, Energy Minister Josh Frydenberg urged his colleagues to read the ACCC report. Asked whether the competition watchdog’s report justified calls for a more comprehensive inquiry, Mr Frydenberg said: “it certainly doesn’t”. “This is the most comprehensive report from our key competition watchdog, and like I said they’ve compelled some 48,000 documents,” he told ABC radio. “There’s a number of recommendations about boosting the transparency in the contract market, which goes to the very heart of what you’ve identified, where vertically integrated generators and retailers have been selling to themselves at particularly high premiums. “There’s no point calling for another inquiry before you’ve read the report of the last one, and this is a really significant piece of work, and importantly it hasn’t just made recommendations around the network wholesale and retail markets, but importantly it has strongly endorsed the national energy guarantee, and we know that the states and the commonwealth are working closely on this important economic reform. Asked whether the ACCC’s recommendation that the government underwrite the construction of a new dispatchable power source would justify investment in new coal plants, Mr Frydenberg said the government was focused on “outcomes, not inputs”. “What the ACCC is focused on here is delivering low cost, firm power to the large commercial and industrial users,” he said. The competition watchdog urges radical reform of the ­National Electricity Market to bring down prices, claiming the gouging of households and business consumers has reached an “unacceptable” level with widespread abuse of market power by the larger energy companies. Recommending the most significant shake-up of the power sector since the NEM was established by Labor prime minister Paul Keating in 1995, the ACCC has told the federal government the current situation has become unsustainable, with customers being ripped off by “hundreds of dollars a year” in ­unnecessary costs. The sweeping investigation into retail energy pricing by the ACCC, commissioned by the Turnbull government last year, has savaged the sector and called for a “reset” of the market to bring down prices and restore confidence. While it expressed support for the Turnbull government’s ­national energy guarantee, the ACCC report found that the market it would be expected to operate in was broken and consumers faced an “unfair” and “misleading” system. One of the key recommendations is for government to effectively underwrite the construction of new dispatchable power sources — either baseload coal or gas — by guaranteeing long-term contracts for large industrial and commercial users. This would make it easier to ­attract finance for operators that do not already have the advantage of a large market share, and provide investment incentive and certainty. In a bid to rein in the market power of the energy ­giants, the ACCC has also recommended that any company with more than 20 per cent market share in generation be banned from any further mergers or acquisitions. This would not apply to the construction of new generation. The report found that large “gentailers” — vertically integrated companies that own both retail and generation businesses — had manipulated prices by charging large premiums on the sale of wholesale electricity to their own retail operations. State governments needed to do more to bring down network costs — the so-called “gold plating” of the transmission network — that make up the bulk of a household energy bill. Greater powers should be provided to the Australian Energy Regulator to address “market ­manipulation”, according to a summary of the report, while discounting schemes that can mislead consumers needed to be more tightly regulated. The final report of the inquiry, commissioned in March last year by Treasurer Scott Morrison, was released this morning by ACCC chairman Rod Sims ahead of the PM’s speech in Brisbane. The government is not expected to formulate a response to the report immediately. Sources claim it is likely to adopt the bulk of the recommendations. It comes as the Prime Minister and Mr Frydenberg stare down a minor ­rebellion in the Coalition partyroom over the NEG and accusations it is too heavily weighted against coal and in favour of renewables. Mr Frydenberg told The Australian last night: “The Turnbull government has a laser-like focus on reducing power prices. The report has found misleading practices by energy retailers in discount offers, with a recommendation that a benchmark be set by the regulator for consumers to compare against rival offers. It has also recommended that the transfer of customers to new discounted offers be hastened and the offers be extended to small business customers as well, while price comparator sites be forced to declare any commissions from retail energy providers. Most of the reform recommended in the ACCC report would fall to state and territory governments. Mr Sims, who was formerly head of the independent Pricing and Regulatory Tribunal in NSW, has been a long-time critic of the network costs, which have only recently begun to fall. The report suggests that the market is no longer operating as it was intended and claims that the current conditions are “unacceptable and unsustainable” and that network charges need to come down. By reforming the way the market operated it would “bring down prices and restore consumer confidence and Australia’s competitive advantage”. The investigation was commissioned because of concern about rising power prices, with the focus on the supply of retail electricity and the competition in retail pricing. 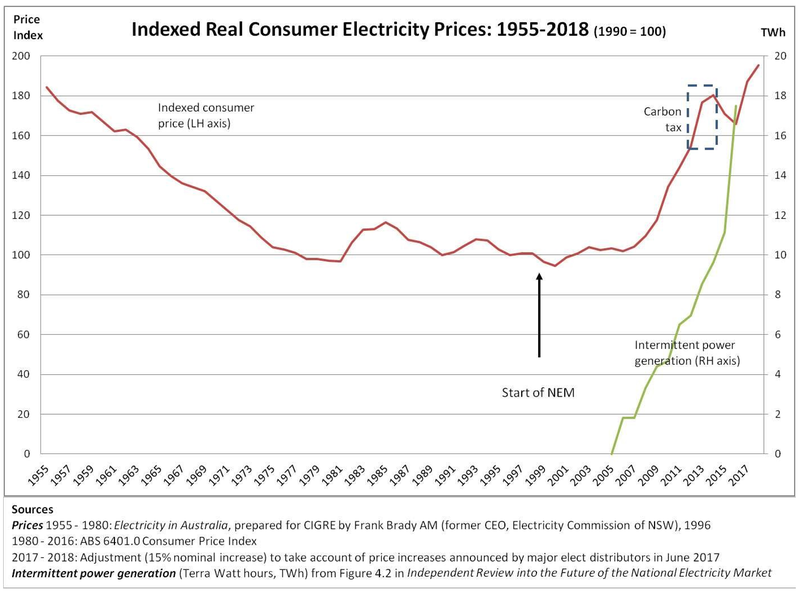 The ACCC was asked to investigate the impact of vertical integration — companies that owned both generation and retail business — anti-competitive behaviour, price transparency and profits of power companies and their relationship to consumer pricing. The report claims that “significant gains can be made for consumers and businesses” if the government adopts the recommendations in the report. Don’t say we didn’t warn you. STT has been banging on about this since December 2012. The graphic above from Dr Michael Crawford spells it out: add massively subsidised and chaotically intermittent wind and solar to your power grid and watch power prices spiral out of control. And yet renewable energy rent seekers keep trying to pin the blame on everything, but the bleeding obvious. One of Australia’s biggest electricity transmission companies has sought to blame power generators and retailers for rising household energy costs, pre-empting a report today by the competition watchdog that’s expected to criticise the entire energy sector. TransGrid, which operates the high-voltage transmission network in NSW, told The Australian network companies were being unfairly blamed for rising power bills. In a strongly worded statement ahead of today’s report by Australian Competition & Consumer Commission chairman Rod Sims, TransGrid declared: “Criticism of network prices in today’s market is misguided. 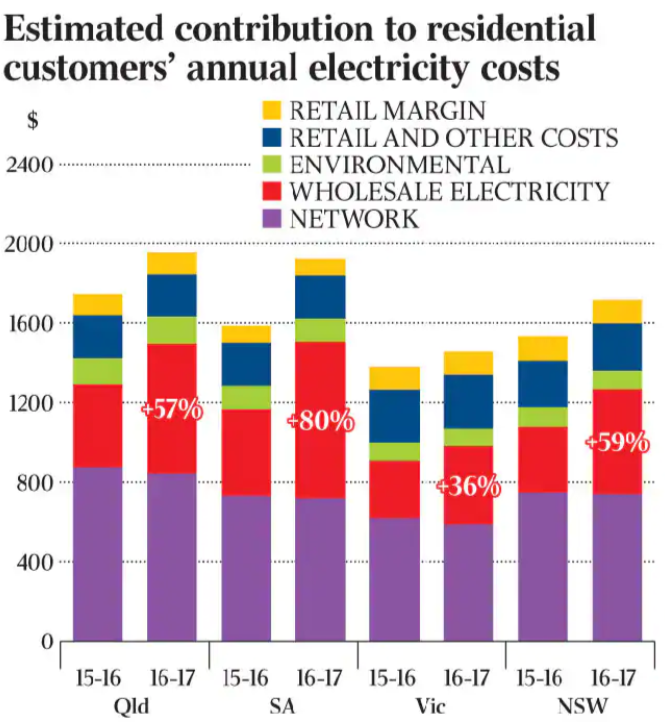 The interim ACCC report on electricity pricing, released in September last year, found increases in residential power bills were “primarily driven by higher network costs” between 2007-08 and 2015-16, when rising wholesale prices took over as the biggest contributor towards rising retail prices. TransGrid cited Australian Energy Market Commission figures showing the share of household power bills attributed to high-voltage transmission and low-voltage distribution of electricity fell from just under 60 per cent in 2013-14 to 47 per cent in 2017-18. 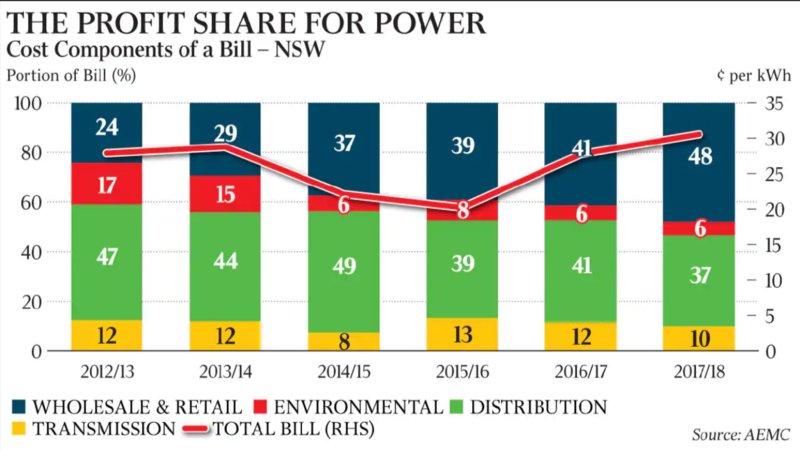 The share of household power bills attributed to electricity wholesalers and retailers, like AGL, Origin Energy and Energy Australia, increased from 24 per cent to 48 per cent over the same period. 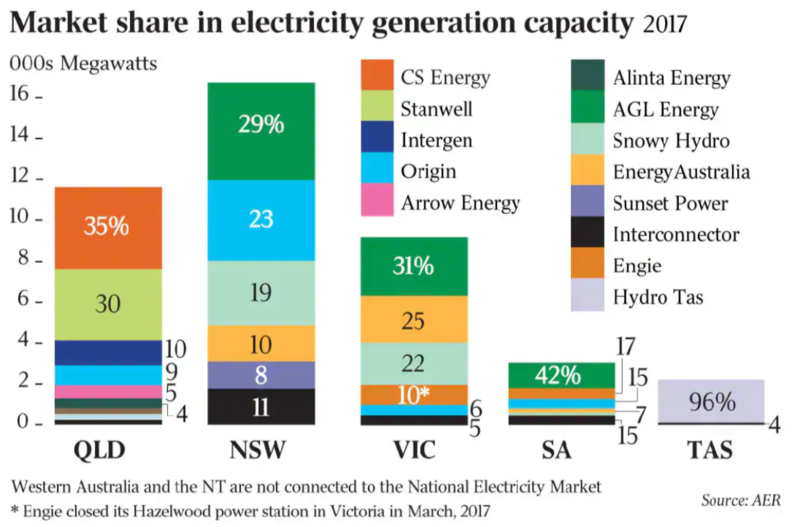 “Data from AMEC confirms distribution and transmission prices in NSW have been falling, both in real terms and as a proportion of the total bill, for the last six years,” TransGrid said. The company said based on the Australian Energy Regulator’s most recent determination for TransGrid, and proposals made by NSW distribution businesses, network costs would fall in NSW for the next five years. It said Australia could learn from the experience in Europe, where strategic investment in transmission infrastructure to support the entry of new generation capacity had significantly reduced wholesale prices, “far outweighing the cost of the new network infrastructure built”. The Australian Energy Council, which represents electricity wholesalers and retailers, said the closure of more than 4000MW of coal-fired generation capacity had driven up wholesale electricity prices since 2012. “In NSW these include the coal-fired Munmorah and Wallerawang power stations. There has also been the flow-on effect in wholesale prices in the National Electricity Market from the closure of the 1600MW Hazelwood baseload power station in Victoria and, to a lesser extent, the closure of the Northern power station in South Australia,” a spokesman said. Experts have criticised the historic “gold-plating” of network infrastructure as a key driver of rising household energy costs. Grattan Institute energy program director Tony Wood said regulation of network companies “has been gradually catching up after some pretty poor outcomes”. “The biggest price rises in the past few years have come from wholesale price rises, but it’s not right to say the networks have been blameless,” Mr Wood said. Yes, network costs rose, starting around 2010, but one major reason for so-called ‘gold plating’ is a need to create grids that can withstand 1,000-3,000 MW – uncontrolled and practically instantaneous – surges in wind power output and equally large, uncontrolled and instantaneous collapses (see above) from hundreds of wind turbines speared in random clusters that need to be connected with city based users, hundreds of kilometres away. On the Eastern Grid Australia’s wind farms are located in 4 States – Tasmania, South Australia, Victoria and NSW – and spread from: Hornsdale in the Mid-North, west to Cathedral Rocks on lower Eyre Peninsula and south to Millicent in the South-East of South Australia; down to Cape Portland (Musselroe) and Woolnorth (Cape Grim) in Tasmania; all over Victoria; and in New South Wales, at Broken Hill in the far west, and right up to Glen Innes in the New England Ranges. 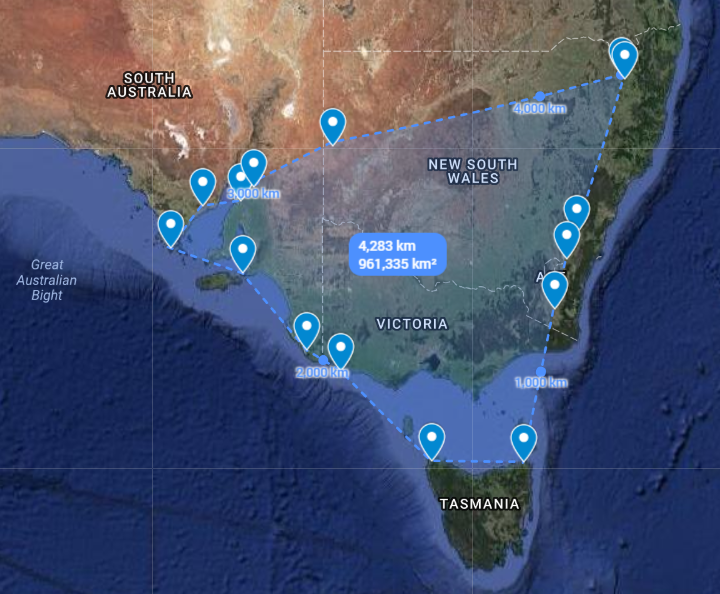 There are over 1,800 turbines in 80 odd wind farms (which range from 20-30 turbine clusters right up to the largest collection of 140 at Macarthur in Western Victoria) – that are spread out over a geographical expanse of 961,335 km². That’s an area which is 4.19 times the combined area of England (130,395 km²) Scotland (78,387 km²) and Wales (20,761 km²) of 229,543 km². Or 1.75 times the 551,394 km² covered by France. No wonder network costs have risen. However, what’s risen fastest are generation costs, which have doubled, if not tripled, in less than three years. Here’s The Australian again. Wholesale power prices in Australia’s two biggest states have hit their highest levels since the national electricity market was created two decades ago, driven by the abrupt closure of the Hazelwood power station and a surge in the costs of gas and coal supplies. Prices for wholesale electricity on the spot market in NSW rose to a record of $82 per megawatt hour for the 2017-18 financial year to June 30, compared with $35 per megawatt hour just three years ago, according to new data from energy advisory firm Energy Edge. Victoria has seen prices triple to $92 per megawatt hour in 2018 from $30 per megawatt hour for the same period three years ago, also marking its highest annual electricity price on record. While prices eased in Queensland and South Australia, they were the second-highest annual figures since 1998. 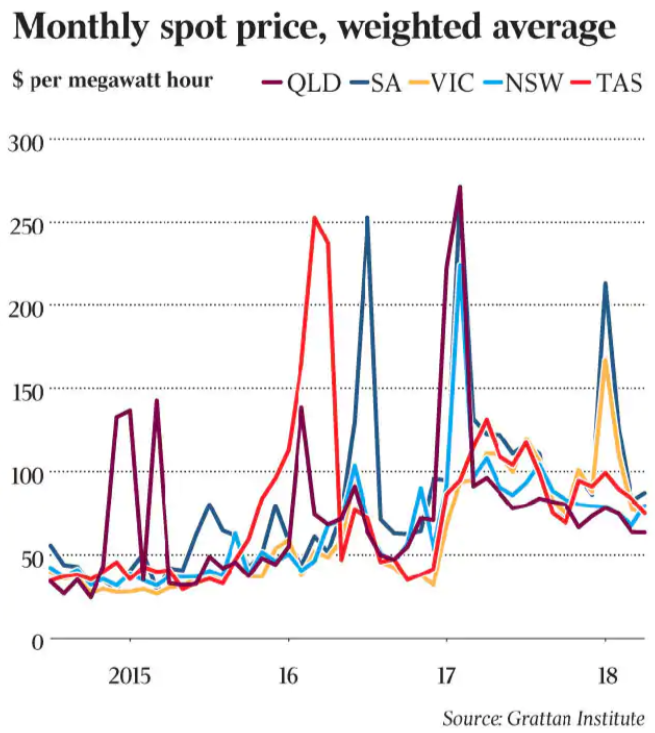 Queensland slipped to $72 per megawatt hour from $93 a year earlier, while South Australia saw levels ease to $98 per megawatt hour from $108 12 months earlier. “The financial year average prices for all mainland regions were either the highest or second-highest electricity prices ever recorded,” Energy Edge managing director Josh Stabler said. The power spike underlines the huge challenge faced by the federal government as it looks to create more reliable supply and lower prices via its National Energy Guarantee policy. The price hit is also a further blow for industrial users as they grapple with coal plant closures, high gas costs and generators gaming the system. A landmark review of electricity supply and pricing by the Australian Competition & Consumer Commission, to be released today, will urge more competition among wholesalers and retailers to help boost long-term contracts for large users. 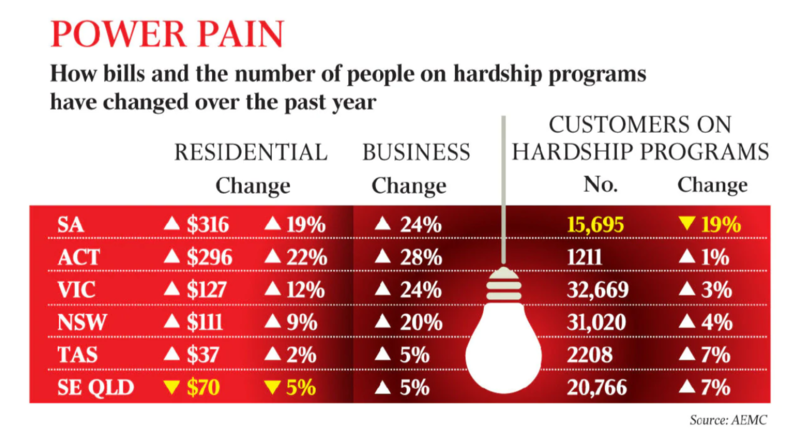 The alarming data on the two state’s power prices is the latest note of gloom for the sector. Australia’s biggest users of energy already faced a $10 billion bill over the next decade to cut emissions under the Paris climate agreement, with heavy industry set to shoulder the bulk of the country’s reduction effort, consultancy RepuTex said last week. Recent electricity and gas price increases will cost energy users up to $11.7bn a year, with more energy-intensive manufacturers to be hit particularly hard, paying up to $3.9bn a year, a separate Ai Group report found. And power costs, most of which went to generators as profit, rose by $10bn, or 125 per cent, between 2015 and 2017, a report by the Grattan Institute said. The Grattan report recommends the National Energy Guarantee be legislated to provide policy certainty and more supply to ensure prices don’t blow out. But after that, the focus should turn to reducing network and retail costs, because new wholesale generation needs prices of $80 per megawatt hour or more to make a return. A Melbourne-based metals business said while it remained frustrated about paying over the odds for wholesale gas supplies, it viewed the government’s National Energy Guarantee and its commitment to cutting emissions as the way forward for Australia. “The energy supply industry requires certainty to implement large scale capital projects for the baseload supply we need,” Ace Metal Treatment Services general manager David Karney said. The NEG is a dead duck, after the release of the ACCC’s report and with the focus back on price and reliability, the NEG being pushed by Josh Frydenberg hasn’t got a hope in hell. And he knows it. 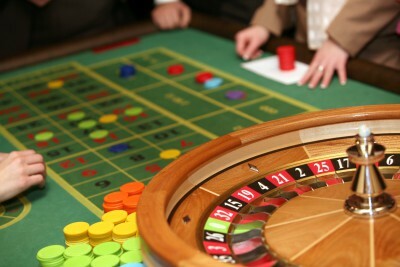 The rapid and massive increase in wholesale prices has a cause, which we deal with below. What happens in the wholesale market translates, soon enough, to retail power prices (see above) which have jumped anywhere between 20 and 28% in the last 12 months, in those states with major wind and solar capacity – adding to 13-20% increases, the previous year. The article above focuses on averages but, as every statistician knows, there’s two sides to every mean. Now here’s another example, this time from Australia’s wind power capital, South Australia. Just before lunchtime on 9 July, on six separate occasions, the spot price for power in SA was at or close to the regulated market cap of $14,200 per MWh. And, just after Noon, a pair of spikes to $10,500 per MWh. 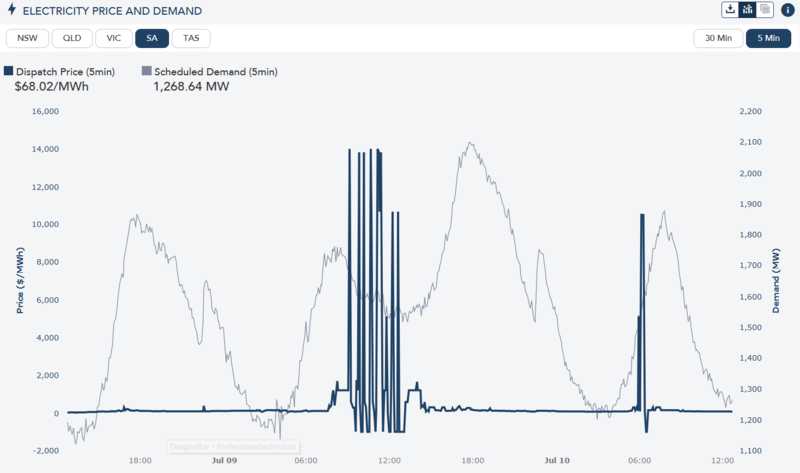 The following day, 10 July, saw a similar performance with the spot price twice topping out at $10,500 per MWh. By comparison, the coal-fired Northern Power Station (dynamited last year much of the delight of its deluded Labor government) could deliver power all day, every day, for less than $40 per MWh. 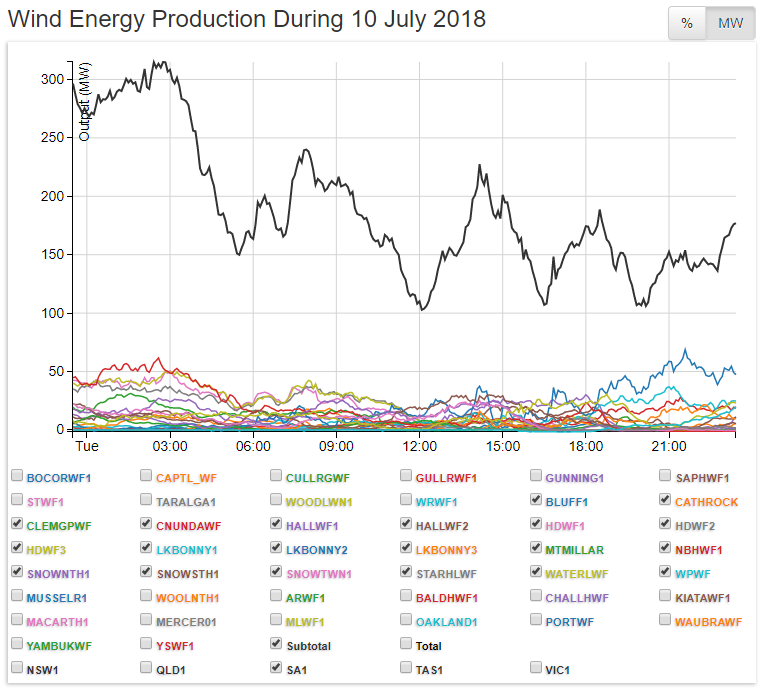 Just as power consumers needed it, SA’s 1,810 MW of wind power capacity downed tools and output hit the floor, plummeting from a paltry 150 MW, around breakfast time, to a risible dribble, by lunchtime. 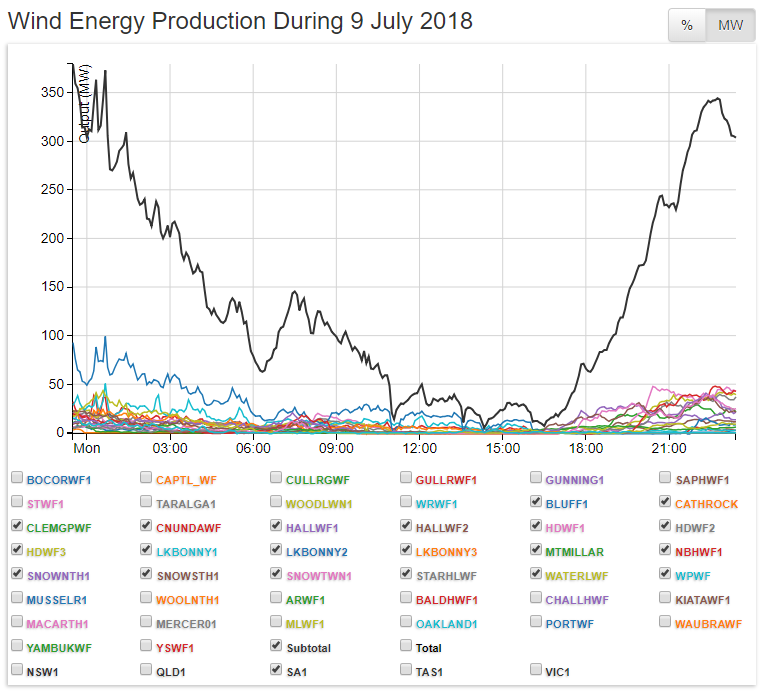 Nature’s little ‘outage’ left the grid manager scrambling to find meaningful supply and those with it managed to extort an amount 140 times the average wholesale price which, these days, sits at around $100 a MWh in SA. For most of the day, SA’s whirling wonders battled to top 200 MW (or 11% of nameplate capacity), collapsing in a series of fits in spurts to around 100 MW, as the afternoon wore on, coinciding with the $10,500 market spikes depicted above. When we say ‘coinciding’, we don’t actually mean that it’s a coincidence. Oh no, this little market artifice was part of a grand design: the owners of fast-start-up gas and diesel generators make a killing every time the sun sets and wind power output collapses, particularly when there’s a concurrent increase in demand. In SA, it happens so often now, as to be the new normal. It’s a 200 MW, 12 unit, open cycle gas turbine plant, originally built by AGL in 2001, which it needed to allow its wind farms nearby to qualify as scheduled generators. Back then, to be a scheduled generator it needed a reliable power source to match its wind power capacity to guarantee delivery of power to the NEM. In 2009, the NEM rules were changed so that wind farm operators did not need to qualify as scheduled generators to dispatch into the NEM and became known thereafter as ‘semi-scheduled’ generators (a linguistic nonsense, if ever there was one). From March 2009, there was no need for wind power outfits to build any more backup power capacity and they didn’t. STT hears that the ACCC is about to take a very close look at the scheduling and dispatch rules, with a view to winding the rules back to what they were in 2008. And about time, too. The turbines for the Hallett Power Station were secondhand and came from a copper mine in Chile. 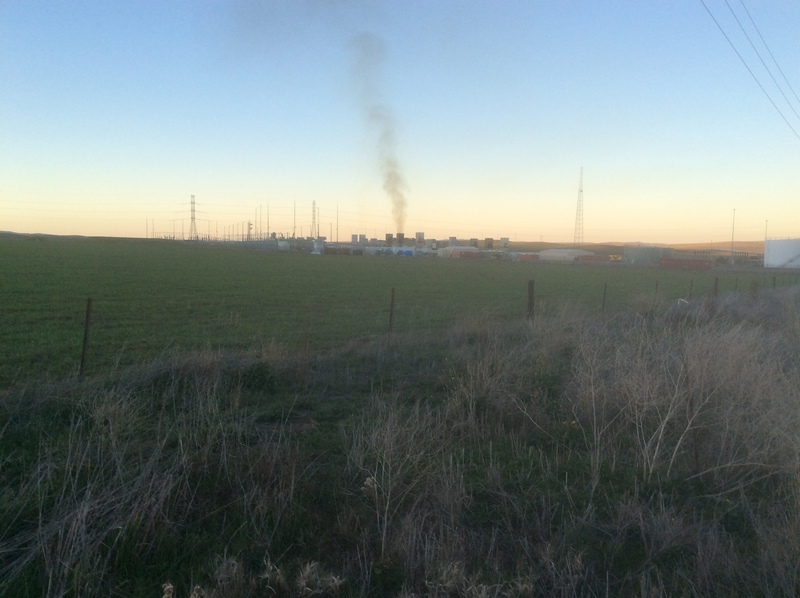 The plant was built next to the nearby Moomba gas pipeline, purportedly to tap into eco-friendly gas. Except that, more often than not, the plant (or at least part of it) isn’t burning clean-green gas but, rather diesel fuel oil and spewing out a filthy, particulate laden, toxic cocktail of nasties. How green is this? The filthy crew backing up wind power in SA. I agree with everything Sarcastic Cynic has said. The way out of this mess which has been created by governments of both persuasions is going to be costly. And guess who will be paying for it? Team Turnbull is still at the helm. Call me cynical, but I don’t believe anything will be done to impinge upon its treasured renewable energy industry. An election is approaching. Politicians will do and say anything to get re-elected.